Catholics have long enjoyed the work of papal videographer Alberto Michelini. Now, under a special arrangement with the Vatican, a four DVD set on the life of Blessed John Paul II has been made available. It contains five hours of dramatic documentary footage, organized by topic into ten films that are each 30 minutes in length. Each film focuses on a different aspect of the pontificate of Blessed John Paul II. These include: youth, children, the poor, the family, Marian devotion, historic events, a day in the papal apartments and the working world. The series is available in English, French, and Spanish. The companion website for this series wwwjohnpaulseries.com has free downloads of companion discussion guides for leaders and participants for each volume with tools for group discussion. The series an ideal tool for teachers to use in Catholic schools, CCD programs and parish adult education programs, and study groups in private homes. It would also be ideal teaching tool for home educators to teach their children about the legacy of Blessed John Paul II. Volume 8, I Am Your Voice is a powerful film on human rights; Pope John Paul is seen interacting with and addressing the poor, the sick and persecuted people from every corner of the globe. A heartbreaking cry of misery is heard from the slums of Latin America and Calcutta, the prairies of Canada, the plazas of South Korea, the Australian Outback, the savannahs of Africa and the shipyards of Gdansk. South Americans who are living in squalid slums while neighbors enjoy luxury occupying land was stolen from them, African lepers living in filth whom the government has forgotten, workers who are deprived of just wages and political freedom, aboriginal tribes who are proud of their culture but whose numbers are decimated–all of downtrodden–Pope John Paul II hears their pleas with love. He tells them “The Church hears your voice,” for he, too, suffered under two oppressive regimes. John Paul speaks unflinchingly in defense of human rights at the United Nations in 1979, attempting to awaken the powerful from the somnolence of egotism. He prays with profound sorrow at the grave of murdered Polish priest and Solidarity activist Fr Jerzy Popieluszko and he is consistently on the side of the downtrodden. He points out that the Church cannot be silent when human dignity is at stake, and though he was often accused of doing so, he refuses to take sides for political purposes. One of the most emotionally charged moments of this documentary is when John Paul II upbraids his fellow Poles in 1991 in Kielce. Shortly after the Solidarity Movement brought freedom to those behind the Iron Curtain, there was a movement in Poland attempting to get the Church out of politics with regard to abortion. 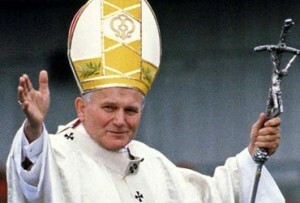 But John Paul II reminded his countrymen that every child is a gift from God. No human being is forgotten in John Paul II’s passionate defense of the dignity of mankind from birth to natural death. These films are compellingly narrated using the best of John Paul II’s encyclicals to educate viewers about why Pope John Paul is called the Great and why millions attended his funeral shouting “Santo Subito!” Don’t miss this outstanding series which offers an unparalleled opportunity to relive this extraordinary pontificate and grow in your appreciation of the historical legacy of Blessed John Paul II. The Catholic Communication Campaign is hosting a contest called JPII They Love You. You can go to wwwjohnpaulseries.com to complete a brief form to win a DVD set (valued at $49.99).